In 1997 Granor Price, Homes of Horsham developed the Riverfront at Palmyra on 22 acres of a 50 acre tract of land. 342 homes were built and began selling in 1998. Today the Riverfront is a quiet, clean community with many different home styles from which to choose – something for every taste. Although not officially an “active adult community,” The Riverfront offers a fitness center and the many benefits of exterior, maintenance-free living to all residents. 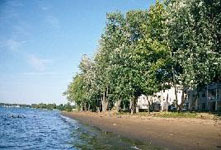 Morning jogging, biking, or walking the paths next to the peaceful Delaware River is energizing! Nature lovers, you’ll absolutely LOVE Palmyra Cove Nature Park, located adjacent to The Riverfront. This 250-acre tract of land is a natural habitat to migratory birds and wildlife indigenous to South Jersey. Palmyra Borough offers lots of small town charm; its downtown business district covers about six blocks. The town is only a few minutes drive from Philadelphia via the Tacony Palmyra Bridge. It provides its own police, fire, and emergency medical services, and has all the conveniences that anyone could ever ask for. Palmyra contains 2 primary and secondary schools. One of the best schools is Charles Street Elementary School, with a rating of 5. The borough also provides commuters to Philly or New York with the RiverLine light rail train that runs through the town’s center – a quick, easy first step on your daily ride to work.